2015-08-11 - Roseville (Minnesota) Lillie News - http://www.lillienews.com/articles/2015/08/11/robot-maker-roseville-ties-picks-fight-japanese-robot - about MegaBots but mentions Matt O's ties to i3. 2015-07-27 - Freep - http://www.freep.com/picture-gallery/entertainment/2015/07/27/maker-faire-detroit-at-the-henry-ford/30739909/ Just photos. Jessica's stuff is 24, Nikki and Brad are 78 (both wearing i3 shirts). 2015-07-23 - Ixiti - http://www.ixiti.com/20150723455/stories/maker-faire-detroit-is-back-with-creative-interpretations-of-classic-games/ Jamie quoted, but i3 described as a "company". Okaaaay. 2014-08/09 - Make Voume 40 - http://www.make-digital.com/make/volume_40#pg44 - i3Detroit listed under "The Most Interesting Makerspaces in America"
2013-12-28 - The Oakland County 115 - http://oaklandcounty115.com/2013/12/28/a-year-of-i3-detroit-awesomeness/ - 2013 summary of i3 Detroit awesomeness. Open letter that Matt O. wrote. 2013-12-17 - The Intelligent Optimist - http://theoptimist.com/can-bankruptcy-spur-growth-2/#!p8IH7 - Can bankruptcy spur growth? 2013-09-25 - The Verge - http://www.theverge.com/2013/9/25/4740634/i3-detroit-and-the-joy-of-mind-controlled-flamethrowers - Article and video featuring Mind Flame, Matt O., Maddy W., Steve S., Jessica R.
2013-07-27 - Detroit Free Press - http://www.detroitnews.com/article/20130727/METRO01/307270029 - 2013 Maker Faire Detroit, mentions member John Sugg's project. 2013-07-30 - PSFK - http://www.psfk.com/2013/06/red-bull-creation-2013.html - The 2013 edition of Red Bull Creation pitted six teams against each other and a 72-hour build deadline. 2013-06-16 - News12 Brooklyn - http://brooklyn.news12.com/news/winners-in-red-bull-creation-contest-announced-1.5495424 calls us "13 Detroit". 2013-02-06 - Oakland County Prosper - http://www.oaklandcountyprosper.com/features/i3detroit.aspx - Hope they fix the "laser printers" typo, otherwise pretty darn good. 2012-11-08 - MetroMode - http://www.metromodemedia.com/features/cooltechmetrodetroit0277.aspx - 5 Really cool inventions in Metro Detroit. i3 Detroit, Matt Oehrlein, and Ed Platt mentioned. 2012-08-27 - Ferndale115 - http://ferndale115.com/nuevo/2012/08/27/what-is-i3-detroit-video/ Lots of video interviews, Matt O quoted. 2012-07-31 - HuffingtonPost - http://www.huffingtonpost.com/2012/07/30/dale-dougherty-maker-faire-detroit_n_1718999.html Interview with Dale Dougherty of Make and a paragraph about the success of i3 Detroit. 2012-07-28 - The Henry Ford Blog - http://blog.thehenryford.org/2012/07/makers-gotta-make/ Matt, i3, and Mind Flame mention + picture. 2012-06-14 - MetroMode - http://www.metromodemedia.com/features/makerspaces0259.aspx has its own page MetroMode Photo Essay 2012-06-04. 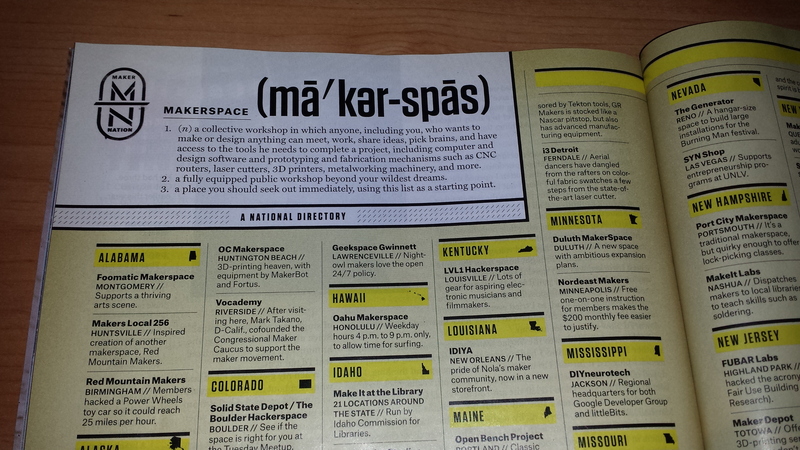 Includes OCD, TechShop, and i3. 2012-04-05 - The Detroit News - http://www.detroitnews.com/article/20120405/ENT01/204050327 "Exhibit a mash-up of DIY aesthetic and unconventional visual artistry"
2012-03-12 - Yahoo News / PRWeb - http://m.yahoo.com/w/news_america/maker-faire-detroit-returns-henry-ford-july-28-100303810.html - "back by popular demand, some Faire favorites, including ... i3 Detroit Hackerspace and Handmade Detroit"
2012-02-29 - Real Detroit Weekly - http://www.realdetroitweekly.com/detroit/best-arts/Content?oid=1540461 - Kristine and Cheryl both named Best of Detroit! 2012-01-04 - Real Detroit Weekly - http://www.realdetroitweekly.com/detroit/stage-and-canvas/Content?oid=1520279 "A festive gift from Spilt Sugar"
2011-12-01 - MAKE Blog - http://youtu.be/xcHMYvuPYGs "Workspace for Michigan Makers: i3 Detroit"
2011-08-11 - Sparkfun - http://www.sparkfun.com/news/681 "You guys are a top-notch hacker space!" 2011-08-03 - Dangerous Prototypes - http://dangerousprototypes.com/2011/08/02/maker-faire-detroit-hackerspaces/ - "Detroit Hackerspaces at Maker Faire"
2011-08-03 - Novi Patch - http://novi.patch.com/articles/novi-resident-shares-quadcopter-at-maker-faire - "Eric's QuadCopter"
2011-08-02 - Press & Guide (Dearborn, Mich. Newspaper) - http://www.pressandguide.com/articles/2011/08/02/news/doc4e38318f7a869362862910.txt - "Maker Faire Recap"
2011-07-31 - MLive - http://www.mlive.com/news/detroit/index.ssf/2011/07/maker_faire_detroit_power_whee.html - "Power Racing Series presented by i3Detroit"
2011-07-24 - Crain's Detroit - http://www.crainsdetroit.com/article/20110724/FREE/307249986/capitalist-tools-coming-techshop-to-open-diy-fabrication-studio - Nick quoted, i3 mentioned at end and in sidebar. 2011-07-14 - PC World - http://www.pcworld.com/article/235402/red_bull_creation_72_hours_to_build_a_crazy_contraption.html "Personally I thought i3Detroit’s build was the most impressive." 2011-07-13 - MAKE Blog - http://blog.makezine.com/archive/2011/07/hackerspace-happenings-red-bull-creation-challenge-concludes.html Talks about 1.21G, but features our video! 2011-03-13 - The Detroit News - Detroit 'hacker space' outlet for would-be inventors Talks about OCD and i3. 2010-12-08 - Metromix - Detroit Urban Craft Fair Just photos. We're 36, 37, and 38. The DUCF cupcake is 66, 67. 2010-09-16 - Element 14 - Hackerspaces: Join One or Start One! 2010-07-29 - Chicago Tribune - 'Maker Faire Detroit' contraptions bonanza sets up - doesn't mention i3Detroit by name, but talks about "a skeeball machine made from parts including spare lumber and PVC pipe." This page was last edited on 20 January 2019, at 22:28.